Fralin Pickups: Lindy Fralin Restores A 1967 Telecaster Bridge Pickup! Watch Lindy Fralin Restore A 1967 Telecaster Bridge Pickup! Lindy Fralin Pickups was started from a pickup repair and rewind business. 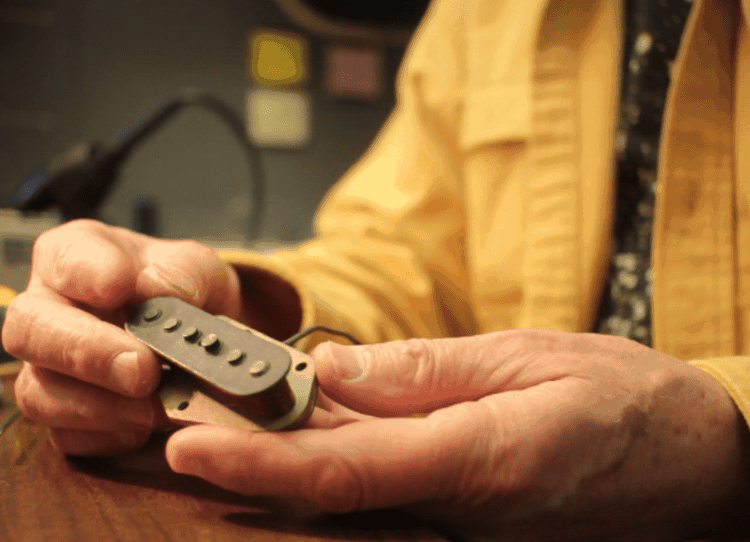 It’s how Lindy started building pickups, and how he started designing new models. It’s the cornerstone of our business that helped turn us into the full-scale manufacturing shop we are today. We’ve repaired and rewound some of the rarest and most sought-after Fender® and Gibson® pickups out there – we know what we’re doing! Our rewind and repair process always starts with an attempted repair of the pickup. Applying fresh solder to eyelets can make some pickups come back. Peeling off a turn or two can find a broken spot on the finished turns. Some come back to life pretty easily, and some don’t. These pickups that are treated to our rewind process! The process that we find works best is a complete disassembly and re-assembly of the pickup. We start by cutting the old copper off (we recycle this), disassemble the pickup, and straighten any bent fiberboard. We also wire wheel the magnets to clean corrosion off of them. Furthermore, we re-assemble the pickup with new lacquer and glue so it will retain it’s shape for more than 50 years. We begin our rewind process by using the original gauge and style of wire. We use the same winding formula on the rewind as we do our new pickups. This ensures it will sound just as good, if not better, than it did in the first place. To finish the process, we re-install the old leads (or apply new leads if requested), and rebuild the pickup’s parts. Finally, we submerge the pickup in a fresh wax bath to preserve it, and the pickup is on it’s way to the customer. What the customer is left with is a brand-new pickup that will last longer than it did in the first place – a complete restoration and cleaning of the pickup, from the inside out. ← How Does Coil-Splitting Work?